Intraperitoneal onlay mesh plastic technique (IPOM) is a common technique for ventral hernia repair. Adhesion formation, seroma formation, impared functionality of the abdominal wall, and chronic pain are frequently observed complications. Adhesions are probably the most important side effect and can be evoked by meshes as well as fixation devices. Different mesh concepts for adhesion prevention or reduction have been developed including coated meshes and single antiadhesive barriers (sAB) for individual coating of meshes. Combining one type of mesh with different sAB (providing a barrier between implant and viscera until the mesh is covered by neomesothelium) formed the rationale to conduct this study and ruled out a possible impact of different mesh materials. sAB were fixed to the mesh in a new atraumatic way by the use of fibrin sealant (FS). 32 rats were operated in open IPOM technique (n=8 per group). One mesh per animal (2×2 cm) was fixed with 4 non-resorbable sutures. An antiadhesive barrier of 2.5 x 2.5 cm was fixed with fibrin sealant (4 I.U.) to the visceral side of the implant. A macroporous polypropylene mesh was used. The antiadhesive layers tested were SurgiWrapâ, Prevadhâ and Seprafilmâ. All sAB are fully degradable in 2 to 8 weeks. Observation period was 30 days, mesh with sutures only served as control group. Adhesion formation, tissue integration, seroma formation, inflammation and vascularisation were evaluated. Adhesions were scored qualitatively using the Vandendael score and quantitatively by evaluating the percental adhesion-coverage of mesh surface. Histology was performed. 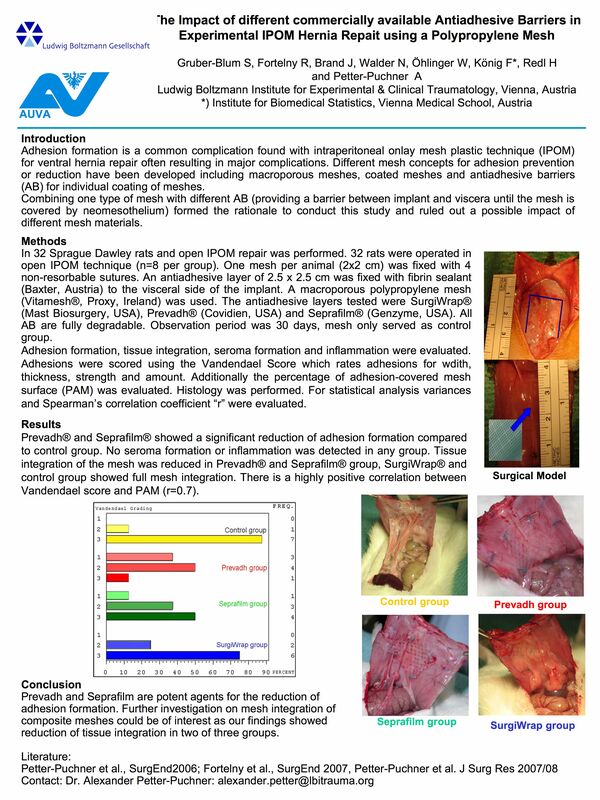 When compared to the control group prevadh group showed a significant reduction of adhesion formation verified by the Vandendael score as well as by the percentage of mesh surface covered by adhesions. Adhesion formation was significantly reduced in the Seprafilm group compared to the control group. No difference concerning adhesion formation was found between SurgiWrap and control group. No seroma formation or inflammation was detected in any group. Tissue integration of the mesh was reduced in Prevadh and Seprafilm group, SurgiWrap and control group showed full mesh integration. There is a highly positive correlation between Vandendael score and percental adhesion area of mesh surface (r=0.7). In our opinion FS is an excellent agent for sAB fixation. The new method of atraumatic fixation is simple and effective. Sealed Prevadhâ and Seprafilmâ are potent agents for the reduction of adhesion formation. A potential relationship between effective adhesion prevention and impaired tissue integration of the implant was observed demanding further research. A poor integration of the mesh into the abdominal wall may influence mesh function.